At the head of Lake Wakatipu, 50km west beyond Queenstown, lies Glenorchy which is the town nearest to the starting point for the well-known walking tracks, the Routeburn and the Greenstone. From Glenorchy, 18km up the Rees Valley Road, are two historic mining sites. An hour’s walk up to the Invincible Mine gives magnificent views of Mt Earnslaw and the Rees Valley. At this 1882 mining site, you will find a unique set of seven berdans (cast iron bowls with steel balls for grinding ore) and the remains of a water wheel and crushing battery. In the valley floor below and alongside the Rees Valley Road, is the 7.9m diameter buddle which is all that remains of the 1884 extraction plant. 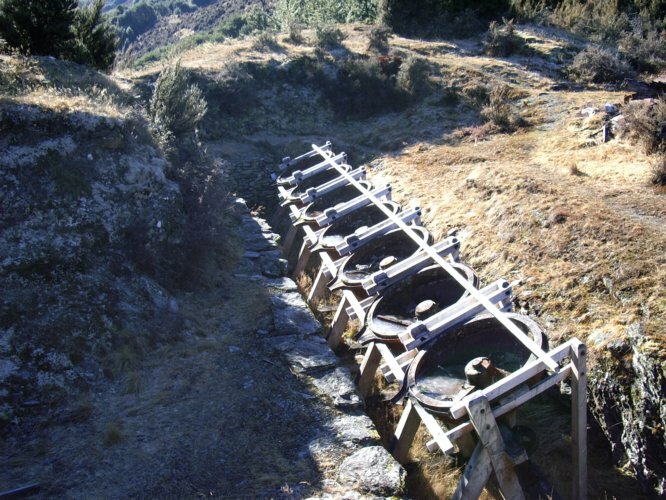 The buddle was used as part of a method for extracting gold still trapped in the tailings which were brought down from the Invincible Battery, located high above on the mountainside. Both of these sites have been protected to demonstrate last century’s technology of milling and concentrating gold-bearing quartz rock.